In the 2010 Geneva Motor Show two months ago, Porsche unveiled a new concept car: the 918 spyder, a hybrid sportscar with a look towards the future and an undisputable link with the marque's most successful models. Porsche says, the 918 holds some of its design cues from the Carrera GT and the most outstanding race car of the last century: the Porsche 917. The birth of this spectacular looking race car, should i remind you, goes back to fourty years. But even today, it's still one of the most admired race cars. 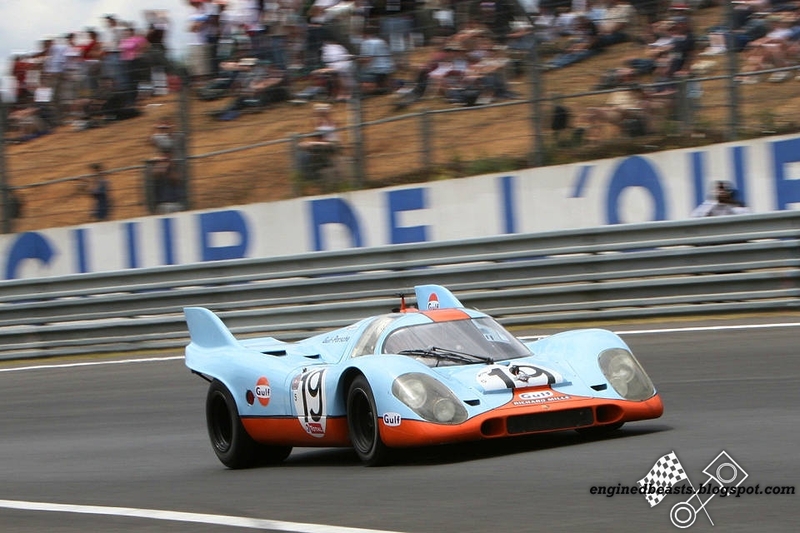 And even after fourty years, it still holds the record of the fastest Le Mans 24 hours race ever with an average speed of 222 Km/h (138 mph) and a total distance covered of 5,335 Kilometers (3315 miles) in the 1971 edition. It also has recorded the highest top speed of 387 Km/h (240 mph) at the Hunaudières straight (6km (3.72 miles) long out of 13.329 (8.28 miles)). 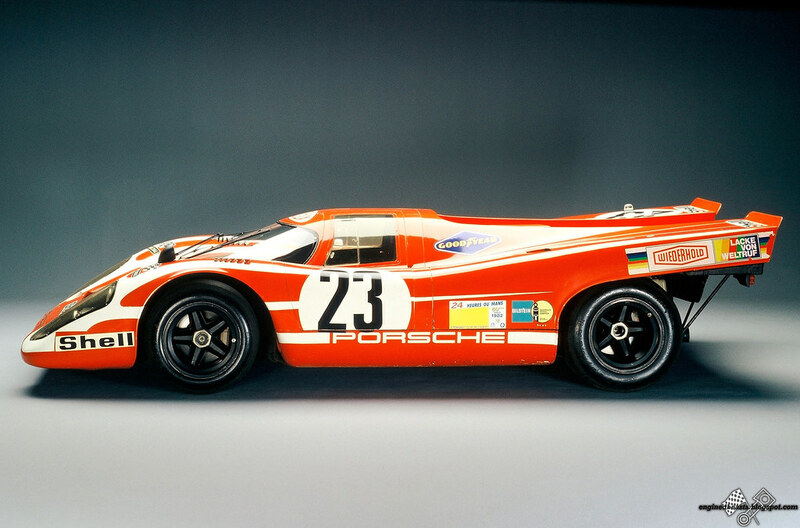 The 917 racer was mainly designed to allow Porsche to finally win the legendary 24 Hours race. Which it did two years in a row (1970 and 1971). And those were the first two victories out of a total of thirteen, making Porsche the most successful automaker at Le Mans. 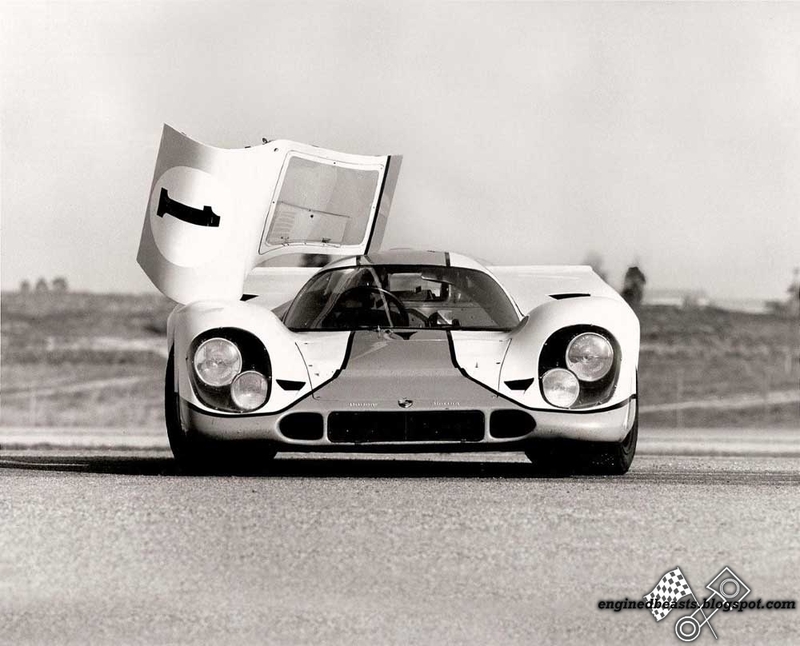 The 917, as successful it was, hides a bad souvenir behind its back. 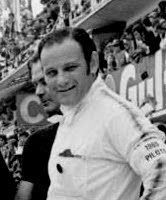 In the 1969 Le Mans edition, British driver John Woolfe lost his life after crashing his Porsche 917 No.10 on lap 1 of the 24 hours race. This tragedy, along with similar ones in racing history reminds us that this is one of the most dangerous sports. So maybe we should think twice before blaming safety rules "excessive" reinforcement. Even if the Porsche 917K's ("K" stands for "Kurzheck" in German) most famous racing colors are the JWA gulf racing livery's red and blue. 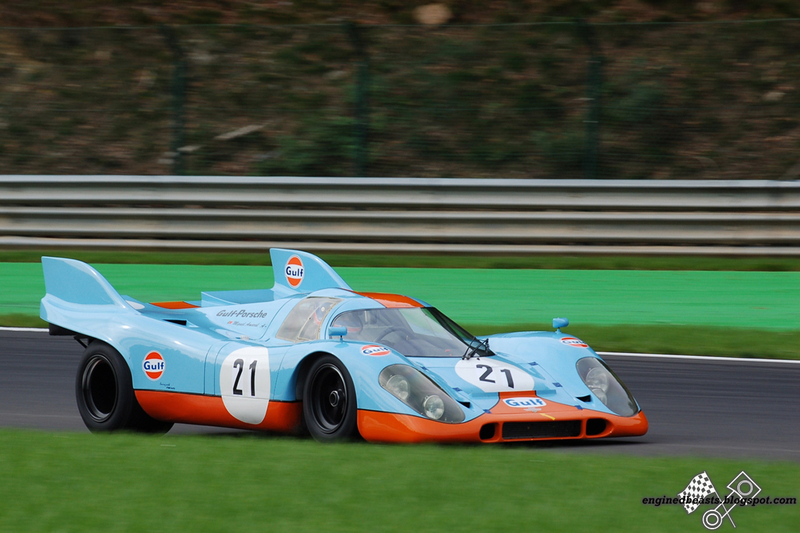 The teams that actually won the 1970 and 1971 Le Mans editions are Porsche Salzburg (car No. 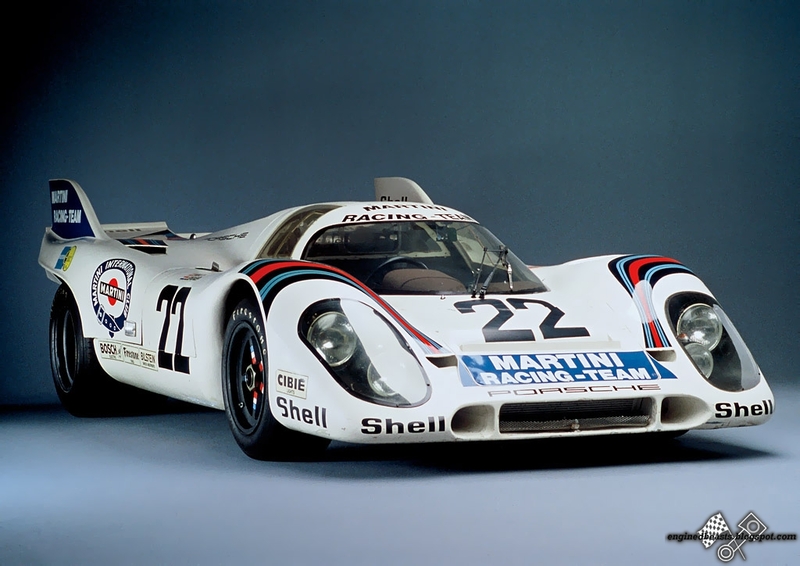 23) with its white and red livery in 1970 and Martini Racing (car No. 22) a year later. 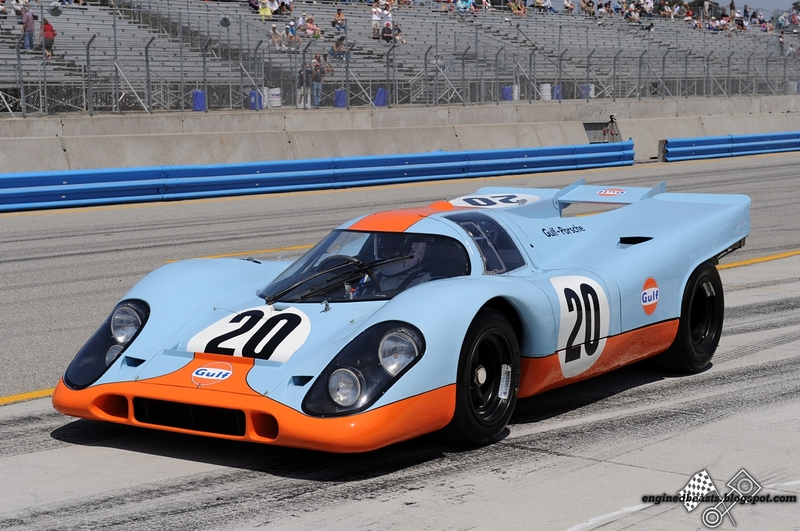 The 1970 edition winner Porsche 917K No.23 from Porsche Salzburg (AUT). Drivers: German Hans Herrmann and Richard Attwood. 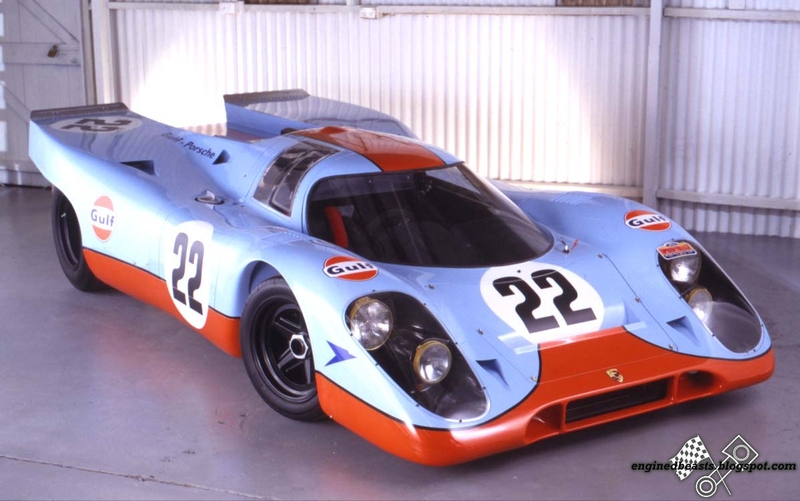 The 1971 edition winner and record holder Porsche 917K No.22 from the Martini racing team (GER). Drivers: Austrian Helmut Marko and Dutch Gijs van Lennep. Technically speaking, the car had very particular twelve cylinder engine which by the way, was Porsche's first rwelve cylinder engine. The engine could be described as a V12 at 180 degrees judging by the shape of its crankshaft which is more common to V engines. Another particularity is the driving position which was moved forward compared to the Porsche 908 and that was due to the bigger engine. In fact, the driver's feet were beyond the front axle. You can clearly notice this detail when looking at the pictures. The weight of the spaceframe chassis was jsut 42 Kg (93 Ib) thanks to the use of exotic materials. 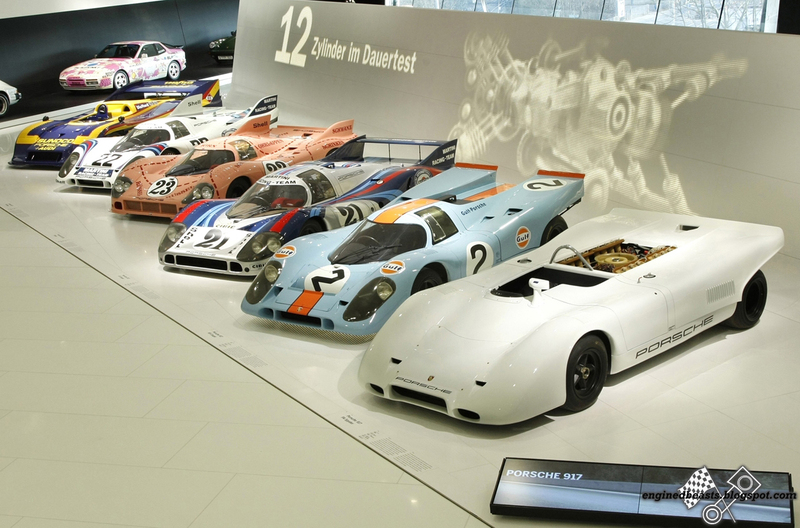 917 variants (from left to right): 1) 917/30, 2) 917K (Martini Racing), 3) 917/20 (known as "pig car" in this livery), 4) 917 LH ("lang Heck" or long tail), 5) 917 K (Gulf racing), 6) 917 PA Spyder.